2-7-2019 – GENERAL MEETING TONIGHT 7:30 AT THE HOME OF MARK & SUSIE EVERHART. BOARD MEETING WILL MEET ONE HOUR PRIOR. ELECTIONS WILL BE HELD FOR PRESIDENT, SECRETARY AND ONE BOARD MEMBER. ALSO, UPDATE ON THE 2019 CALENDAR OF EVENTS. 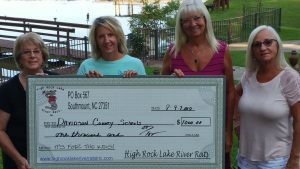 The River Rats donated $1000 to the kids at Southwoods and Southmont Elementary schools. Kim Hedrick, Davidson County Social Worker, accepts the donation on their behalf. 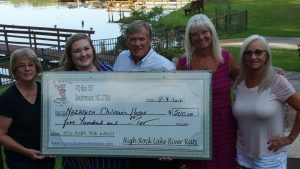 The River Rats donated $500 to the American Children’s Home for an outing for the kids. 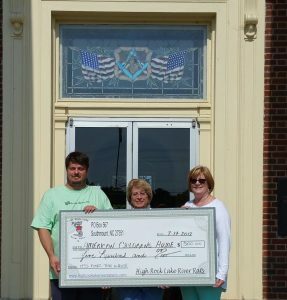 A $500 donation was made to the Nazareth Children’s Home for their emergency family funds. If you enjoy having fun for a great cause, please consider becoming a River Rat. The River Rats have helped hundreds of children in need in our own backyard since 1987 and we continue to be RIVER RAT STRONG.